Refrigerate the watermelon, so it is icy cold! Lemons – juice two whole lemons. You may prefer to use more or less juice. Two lemons is a good start and you can adjust to taste. Green Tabasco Sauce – start with 4 – 6 drops from the bottle. This is fairly mild. If you want to taste the chilli, add it to taste! Put all ingredients into a blender and ‘blitz’ until smooth. Add a handful of ice, and serve immediately in a special glass. 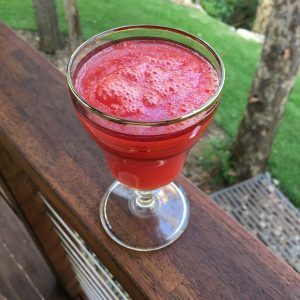 Watermelon (especially cold) is tasty, refreshing and incredibly good for us. Not only because it’s composed of mostly water (over 90%) but because it also contains many nutrients, such as lycopene, antioxidants and amino acids, in addition to vitamins A, B6 and C.
Lemons add an abundance of flavour to drinks and they are also incredibly healthy, providing iron and magnesium, B1, B2, B5, B6, calcium, potassium, copper and folate. If the whole lemon is used (not just the juice) they also provide fibre. The salt and splash of Tabasco add some extra ‘oomph’ to this drink! If you like a strong taste, you can’t go past Melon Blast! Where alcohol can deplete or inhibit absorption of vitamins and nutrients, a drink like Melon Blast builds them up. It doesn’t take too long to feel the difference between a drink that’s robbing us of health, and one that’s sending healthy nutrients flooding through our body. Try a Melon Blast today!